Treefrog, I'm glad I could help out and get this book over the finish line. It was an honor and a privilege to work with you. It was a privilege and an honor to work with you on this as well. I'm glad that you volunteered to proofread/edit this monster of a sourcebook. Here's a compressed version of the fan book. It's only 33 MB as opposed to the 122 MB. Just took a quick look at this. It certainly looks like a genuine WEG product. Granted, there are a few mixing of idioms in the writing so some editing would have been nice, but that's going to be a given for most fanbooks. Still and all, this looks like a really nice book, Cheshire. Thanks for all your hard work on this. 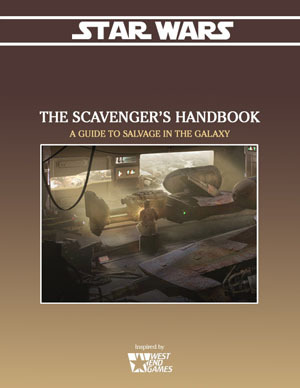 Now I'm expecting us to have a debate on whether this book is meant for actual gameplay or if it's just a not-meant-for-actual-gameplay release like Eric Trautman's Rogue One's Galaxy Guide and thus didn't need editing. I'd started working on it about five years ago, and hadn't done any real work on it for about two and a half. You're totally right. It needs some editing. Overuse of passives, excessively wordy passages, and some consistency issues. In the end I decided that I didn't have the time to continue to work on it and it was either release it as it was or abandon it. Now that I have enough of the technical know-how to make it look similar to a WEG product, I would rather get it off my plate and get it out there rather than it doing no good to anyone on my hard drive. My take is that if you can find use for it, use it. If you want to modify it... it's a fan work and modify it to fit your game. If it isn't one's cup of tea, then there's plenty else to drink in the community. So, yes. It's got flaws. Just ones I wasn't going to have the resources to work with in the foreseeable future. In the thread announcing the Library, I asked the community if there were any glaring omissions. I keep finding glaring omissions. There have been tons of downloads, but no one in the community is helping me find anything I missed. Please look through the list at the above URL. If you don't see something you think should be there, please point it out. If possible, please also provide a link to it, even by PM if preferred. Let's start here. I need the following PDF. I don't know how I missed it when it was fresh, but now I can't find an actual download link at the URL and I am not giving them my Facebook, G+ or Twitter passwords. Without that it's all spyware and crap. I hate 4shared! Does anyone have this in a form that can be legit shared with me so I can upload it to the Library? Please and thank you! EDIT: Heh, looks like more than one of us has the file in question. Thanks, Sutehp! I've poked around your goodies before but must have missed it. I'll have to go back and look around some more. Any other fanmade supplements you want to point out? Wow, my apologies. I didn't realize you were missing so many things, Whill. I just figured since you've been here for a good long while you just had everything. I'll take a peek through and see if I can find anything that's in my collection of fanmade stuff that you might want or need. Any other fanmade supplements you want to point out? I have to say I like that the rancor pit library is a reasonably short one. The G+ community drive is sooo full with stuff and hard to navigate to find what you want.